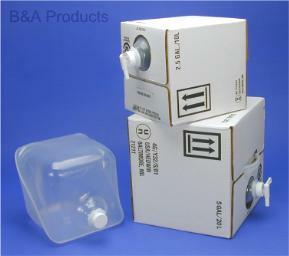 CubitainerÃƒÆ’Ã¢€Å¡® is a low-density flexible polyethylene cube-shaped insert inside a heavy-duty corrugated outer carton. Easy to ship, handle and pour. Empty inserts nest for low cost shipping and storage. After use, package is easily collapsed for economical disposal. Perfect for a wide range of chemicals. Pull-out spout has precision injection molded threads. All styles come with 38mm white polypropylene cap with polypropylene foam liner. Assembled CubitainerÃƒÆ’Ã¢€Å¡® is factory assembled and meets UN specifications.